Injection pressure is provided by the hydraulic system of the injection molding system. The pressure of the hydraulic cylinder is transferred to the plastic melt through the screw of the injection molding machine. The plastic melt is pushed by the pressure, and through the nozzle of the injection molding machine, it enters the vertical passage of the mold. And through the gate into the mold cavity, this process is the injection molding process, or called the filling process. The existence of pressure is to overcome the resistance in the melt flow process, or conversely, the resistance in the flow process needs to be offset by the pressure of the injection molding machine to ensure the smooth progress of the filling process. In the injection molding process, the pressure at the nozzle of the injection molding machine is the highest to overcome the flow resistance in the whole melt. Then the pressure gradually decreases along the flow length to the front wave front of the melt. If the exhaust inside the cavity is good, the final pressure at the front end of the melt is atmospheric pressure. There are many factors influencing melt filling pressure. There are three kinds of material factors, such as plastic type, viscosity and other structural factors, such as type, number and position of pouring system, mold cavity shape and thickness of product, etc.3 technological elements of molding. 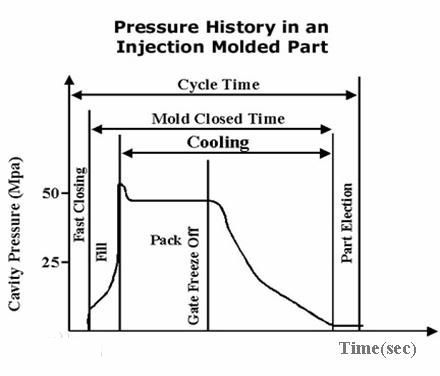 The injection time here refers to the time required for the plastic melt to fill the cavity, excluding the opening and closing time of the mold. Although the injection time is very short and has little effect on the forming cycle, the adjustment of injection time plays a great role in the pressure control of the gate, runner and cavity. The reasonable injection time is helpful to the ideal filling of melt, and it is very important to improve the surface quality of the products and reduce the dimensional tolerance. The injection time is much lower than the cooling time, which is about 1 / 10 / 1 / 15 of the cooling time, which can be used as the basis for predicting the whole molding time of the plastic parts. In the analysis of the mold flow, the injection time in the analysis results is equal to the injection time set in the technological conditions only when the melt is completely driven by the screw rotation to fill the cavity. If the screw pressure control switch occurs before the cavity is filled, the result of analysis will be greater than the setting of process conditions. Injection temperature is an important factor affecting injection pressure. There are 5 ~ 6 heating sections in the injection molding cylinder, and each material has its own appropriate processing temperature (for details, please refer to the data provided by the material supplier. Injection temperature must be controlled within a certain range. Too low temperature, poor plasticization of the melt, affect the quality of forming parts, increase the process difficulty; too high temperature, the raw materials are easy to decompose. In the actual injection molding process, the injection temperature is usually higher than that of the cylinder, and the higher value is related to the injection rate and the properties of the material, and the maximum temperature is up to 30 ℃.This is due to the high amount of heat caused by the shear of the melt through the feeding hole. There are two ways to compensate for this difference in mold flow analysis, one is to try to measure the temperature when the melt is injected into the void, and the other is to include the nozzle in the modeling process. At the end of the injection molding process, the screw stops spinning and only moves forward. In the process of keeping pressure, the nozzles of the injection molding machine continuously feed into the cavity to fill the empty volume due to the shrinkage of the parts. If the cavity is filled without holding the pressure, the part will shrink about 25%, especially because the shrinkage of the rib is too large to form shrinkage trace. The pressure holding pressure is generally about 85% of the maximum filling pressure, which should of course be determined according to the actual situation. Back pressure is the pressure that needs to be overcome when the screw reverses and recovers the material. High back pressure is good for color dispersion and plastic melting, but it also prolongs screw shrinkage time, reduces the length of plastic fiber and increases the pressure of injection molding machine. Therefore, the back pressure should be lower, generally less than 20 parts of injection pressure. Injection foam, the back pressure should be higher than gas formation pressure, otherwise the screw will be pushed out of the barrel. Some injection machines can program back pressure to compensate for reduced screw length during melting, which reduces heat input and reduces temperature. However, because the result of this change is difficult to estimate, it is difficult to adjust the machine accordingly.